Today, souvenir programs are typically only available at prestigious theatrical presentations in select venues, which for the general public are sadly increasingly fewer and far between. When the Star Wars Trilogy was originally released, however, they represented one of the nicer keepsakes obtainable to many cinema patrons around the world. While some were handed out at special screenings or sold as point-of-purchase items in theaters, others were retailed at local newsstands and bookstores as marketing models shifted. Published by George Fenmore Associates – whose parent company produced numerous movie programs from the 1960s to the 1980s – the original Star Wars program features Tom Jung's artwork from the theatrical half sheet poster and encompasses 18 pages of photographs, character and actor biographies, and behind the scenes tidbits about the making of the film. The content and layout resemble what was presented in 20th Century-Fox's lavish campaign book, simply repackaged for the Star Wars-hungry consumer. The program does not have a synopsis, but rather focuses on the cast and their characters as a means of telling the story while letting fans become familiar with the fresh-faced new stars. Everyone became aware from the get-go that Mark Hamill was a water sports enthusiast living in Malibu, and that Anthony Daniels was "dark and good looking but unfortunately, his face is never seen in Star Wars." Veteran actors Alec Guinness and Peter Cushing are sensibly highlighted, with the latter duly referred to as "one of the great perpetuators of screen villainy." On the subject of villainy, story-related descriptions in these early publications often introduce narrative oddities, such as Tarkin's alleged "insatiable political ambitions to become Emperor." They're also rife with colorful language that, when considering these iconic characters were being officially defined to the masses for the first time ever, are somewhat amusing. Artoo-Detoo is labeled a "feisty, rebellious automaton" that "moves on thick clawed legs," while Chewbacca the "hundred-year-old giant Wookie [sic]" has a "quasi-monkey face with large blue eyes that soften his awesome appearance." Meanwhile, Jawas "smell horrible, attracting small insects into the dark recesses where their mouths and nostrils should be." Gross. Tusken Raiders are deemed "marginally human creatures," which seems slightly offensive. Stormtroopers "enforce restrictive laws disregarding human rights." What about Sandpeople rights? Their race has the world "people" in it, after all. Finally, the Rebels are characterized as "Idealists and adventurers from a small number of systems joined together to stop the [Empire-induced] growing outrages." Sio Bibble would be proud. Color photos are interspersed within the program and the behind the scenes section succinctly relays the story of the film's genesis and production. My favorite line of copy is from the segment on the formation of the Industrial Light and Magic Corporation, where "One medical student quit med school to build models in this giant adult-kid world." In terms of variations, the first printing of the program has a smooth, glossy cover and interior pages with a tan hue, while the second printing has a semi-glossy pebble-textured cover and matte interior pages with a pink hue. A third printing has similarly pink colored matte interior pages but a semi-glossy textured cover distinct from the pebble tone of the second printing. Finally, a fourth and less commonly seen printing has a matte, cross-hatched textured cover. There are minor differences in content layout from the first printing and subsequent printings as well (the details of which can be viewed in this fantastic reference thread in the Tantive XI Forums). As stated at the back of the U.S. version of the program, additional copies could be ordered by mail for a reasonable $1.50 (plus postage) each. The first three iterations have the same reorder pricing information, while the fourth printing has revised text that notes a $2.00 all inclusive price and a 6-8 week delivery time required for personal checks. Patience, soon you will be with your additional souvenir program! The third version of the program produced in the U.S. by George Fenmore was purchasable in the U.K. (the key distinction being the 75p price and S.W. Ventures, Inc. London address listed). Rather than printing a completely separate German-language version of the program, a supplement in German with equivalent information on the characters and plot was bundled and sold together with the English program book for the film's release in February of 1978. The German interpretation of "A long time ago in a galaxy far, far away" poses the perplexing statement "Once upon a time in the distant future..." Wann sind wir?! Those lucky enough to attend special pre-release screenings received simple yet sleek programs or "credit sheets" issued by the studio. These navy blue foldouts with the film's logo in silver donning the front and the cast listed on the back open to reveal production credits inside. This color scheme was also used for screening invitations and other promotional material (which will be covered in subsequent articles). Pictured below is the interior of the credit sheet from the U.K., which is essentially identical to the American version if not for a few minor deviations in the text on the second page (note the British spelling of "colour" in the Technicolor credit). A more obvious irregularity with this particular example is the inclusion of an insert for theater owners with a "digest" version of the production's backstory, advertising billing designations, its "U" Certificate, and its running time. Additional related press material (which will be covered in a forthcoming article on pressbooks and press kits) was packaged with the credit sheet and sent out by 20th Century-Fox's U.K. division. The Universally Certified "odyssey from innocence to knowledge" is a 10,875 ft journey in celluloid, delivering audiences "an infinite variety of vicarious emotional, physical, and mystical delights." Published in the United States by Ballantine Books as "The Star Wars Album," the first Official Collectors Edition magazine and its internationally dispatched counterpart have the Hildebrandt poster imagery adorning the covers and afforded aficionados a much greater extent of digestible Star Wars content. While the U.S. version was primarily sold in bookstores, the international version put out by the Marvel Comics International Group as a Movie Spectacular was vended at newsagents and apparently in certain U.K. cinemas. One local Odeon in Woolwich with well-stocked concessions peddled the Official Collectors Edition alongside the regular program, though this may have been a case of a entrepreneurial theater manager seeking extra tie-in revenue. "In an age where films tend toward fear and nightmares, it is certain that Flash Gordon and Star Wars are healthy diversions." Flash Gordon is fittingly used as a bridge to the publication's next topic: the Classical Hollywood ingredients that went into Lucas' "Intergalactic Mulligan's Stew," including but not limited to robots, monsters, and comedy duos in abusive relationships. A central component of the magazine is a detailed retelling of the film's plot, complete with dozens of images in the same vein as the storybooks published by Random House. For those that were eager to relive the movie as they waited for its next theatrical re-release, this had to have been a viable option. The remainder of the book is devoted to behind the scenes coverage, with profiles on Lucas, Ralph Mcquarrie, John Williams, and robotics effects master John Stears, as well as an extensive feature on John Dykstra and the visual effects work by ILM. There are scores of "making of" photographs which had to have thrilled readers at the time. With their iconic artwork on the cover, the international version added a deserved mention of the Hildebrandt Brothers – talented twins who "seem at first glance to represent the last of a dying breed of hippies that cling to their scruffy beards and sparce frames." Another feature of the magazine that is quite entertaining in hindsight is a "Star Wars Glossary." In addition to helpful anatomical diagrams of the droid duo (who knew that R2 had a "Logic Dispensor" or that 3PO's mouth is classified as a "Vocabulator" and that he was equipped with a "Pelvic Servomotor"? ), the glossary provided such useful definitions as: "Robot - n. a mechanical man." Also of note are Chewbacca's official pseudonym "The Walking Rug" and the designation of the Rebel spacecraft as "X-Fighters" and "Y-Fighters." At the time of the Album's publication, Star Wars was just "edging out Jaws for the numero uno spot" on the all-time box office list. It clearly states that this was "only the beginning" and that a sequel was on the way. The conclusion declares "Already there is a full-length feature film scheduled, due in fall of 1978" and anonymously ponders, "Will his [Lucas'] hero [Luke] marry the strong willed, but willing Princess Leia? Or, will he have to challenge Han Solo to a duel for Leia's hand?" Pfft, Leia wouldn't have tolerated such misogynistic melodrama. The international version further mentions that "Two new additional locations, an ice and a tropical planet, have been added for [the droids] to explore." Japanese movie programs, much like the country's cinematic experience in general, are distinguished by a sense of significance and class. Printed on high quality glossy paper stock and loaded with extravagant color photo spreads, the Star Wars program from Japan is a fine item. The cover displays a modified version of the Japanese advance teaser one sheet poster artwork in striking silver against the deep blue starfield. Measuring approximately 8.25 x 11.75" and 36 pages in length, its contents are comparable to those of the American program with character bios and production notes, etc. Where the Japanese programs stand out is the quantity of images. The pages' busy compositions are eye catching, to say the least. With the film not being released in the country until June, 1978, 20th Century-Fox and Toho (the Japanese film production and distribution company that gave the world Godzilla) had ample time to accumulate imagery and up-to-date background material for the program, and it shows. The interior title page spread interestingly exhibits the original, longer form of the infamous preamble as it was written in the final draft of the screenplay from January, 1976. Seen below is one of the program's two-page color photo spreads (notice the upside down image of the Falcon in flight). Parelleling the "glossary" from the Star Wars Album, the Japanese program has a section labeled "MECHANICALS" that identifies and categorizes various weaponry and technological elements from the film. I'd be curious to know what the Japanese translation for "Pelvic Servomotor" would be. A second, larger Star Wars program from Japan is horizontally oriented and measures 10 x 14.25". This oversize program has a color scheme mirroring the country's previously mentioned teaser poster and like the trade paperback size program, it contains information about the film and a variety of black-and-white and color stills. The film also made its debut in South Korea in June of '78, and a similar oversize program can be found which prominently incorporates its success at the 50th Academy Awards (though I'm not exactly sure why 8 Oscars are depicted; the film won 6 – plus Ben Burtt's Special Achievement Award for his alien, creature, and robot voices (and mustache) – and was nominated for 4 others). A 9th award on the end presumably denotes the Golden Globe that John Williams won for the score. This lineup of golden accolades was used in the country's one sheet too. Coming full circle to return to the original program, a corresponding iteration featuring a striking orange version of the "pointy W" logo and the addition of the droids to the cover artwork was printed in Madras, most likely for the premiere at the Safire Theatre in either December, 1978 or January, 1979. The Safire is said to be the first cinema to run 70mm in the country. Another tangentially related note – the film had premiered in Bombay at the Sterling Theatre about 10 weeks earlier, which was one of the first THX-Certified theatrical venues in India. This full color program is essentially identical to the American version, though a bit smaller and printed on dull paper stock. Traditional movie programs began to fade out by the early 1980s across the industry in the U.S. as their odd sizes and more delicate material gave way to a more standardized magazine-style format which could be disseminated in multiple markets and venues such as newsstands and bookstores. Hence the return of the "Official Collectors Edition" format for The Empire Strikes Back. Though these special magazines were available for purchase in theaters, they were not exclusively sold there. Released by Paradise Press, Inc., the magazine has about 60 pages of written sections on the filmmakers, characters, plotlines, and making of the film interspersed with color photos and alluring two-page spreads of Ralph McQuarrie concept paintings. The cover notably uses the earlier and "busier" version of Roger Kastel's Style A poster artwork which brandishes representations of Cloud City, Lando, Boba Fett, and an integral new character: the Rebels' Radar Laser Cannon. While the original Star Wars program was uncomplicated and elegant, the Empire Official Collectors Edition has a uniquely charming 80s tackiness to it. Brightly colored textual arrangements, plentiful BOLD TYPESCRIPT, and lines...lots and lots of lines. The table of contents captures the magazine's complexion well with its almost neon-like pink and blue palette. "Her icy control is necessary on many occasions when the Rebel forces come under attack from the Empire. Once again in The Empire Strikes Back she proves she's got stamina, determination and can handle a blaster as well as any space ranger." A Toy Story crossover immediately comes to mind, with Leia teaming up with Buzz Lightyear to take down the evil Emperor Zurg. Character bios for newcomers to the story such as the Bounty Hunters (or "space vermin") are integrated within the magazine's 3-part plot synopsis. Their marvelous descriptions are lifted directly from drafts of the screenplay, wtih Bossk, for instance, being delineated as a "slimy amphibian creature with two huge bloodshot eyes in a soft baggy face" being joined by "Zuckass [my emphasis] and Dengar, battle-scared mangy human types." It's odd to think about a time before Empire's big paternity reveal was common knowledge. While going into fairly specific detail about the majority of the film's story, the final confrontation between Luke and Vader is only very briefly summarized and its implications are agonizingly absent. "When they meet, it is the Force itself in combat. It is a fight between the dark and the good side. Although Luke resists Vader's entreaties to join the Empire he cannot match the towering, evil strength of the Dark Lord. Vader corners him. It is the end for Luke. Then young Skywalker takes a death-defying leap to a rendezvous with the Falcon." The "Force itself in combat" is a stirring way to concisely interpret the pivotal confrontation between father and son. The pre-release and press screening credit sheet for The Empire Strikes Back is off-white in color with a bold, black rendition of the logo and expands to expose four supplementary pages when completely unfolded. 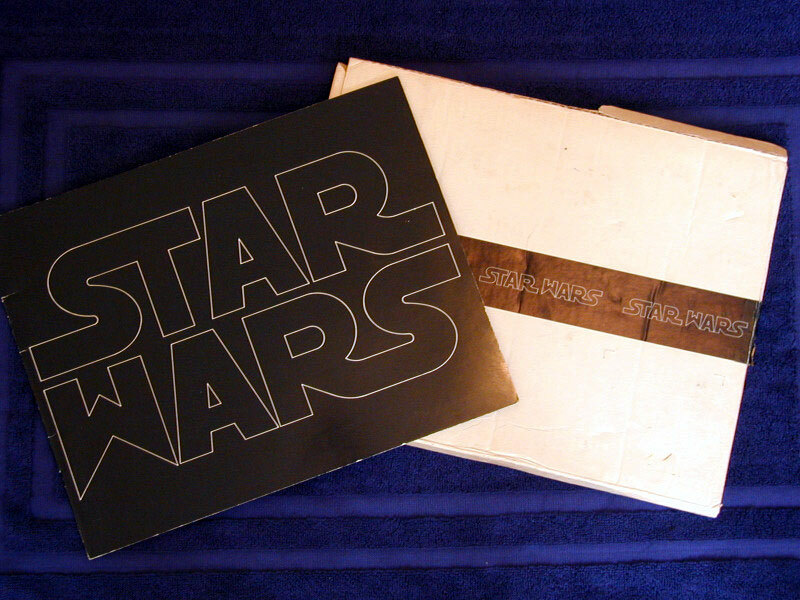 Like the Star Wars foldout, its basic design was replicated for assorted special screening tickets and invitations. The Empire Strikes Back made its debut in Europe with a Royal Film Performance at the Leicester Square Odeon in London on May 20th, 1980. Screened in the presence of H.R.H. The Princess Margaret, Countess of Snowdon, the charity premiere even sparked its own "Empire Day" holiday that saw Stormtroopers take to the streets and Underground in promotional efforts. Fortuitous attendees received a 21 x 30cm (or roughly 8.25 x 12") special program to commemorate the event with the menacing visage of Darth Vader ethereally dominating the starscaped cover. The Odeon had been a venue for such other 70mm Royal Film Performances as West Side Story in 1962 and Close Encounters of the Third Kind in 1978, among many other high-profile British premieres and first run engagements. 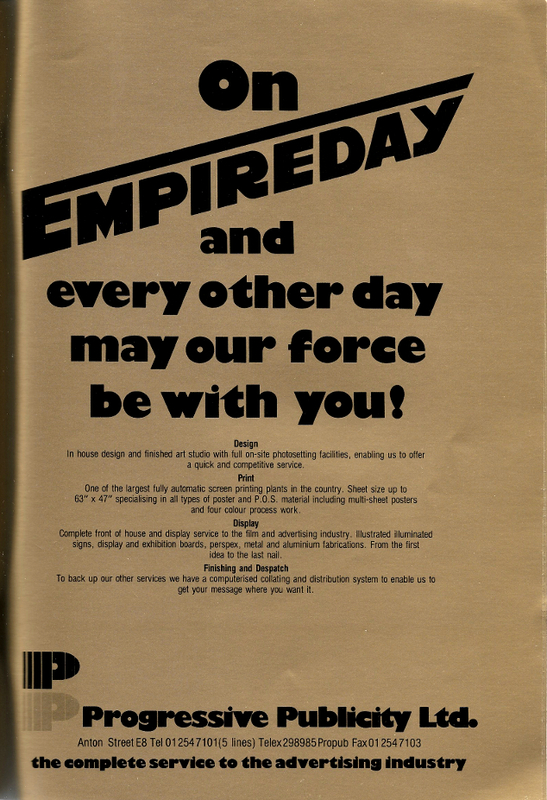 Following a live performance of pieces from the score by Alyn Ainsworth and his Orchestra (including a rendition of the Imperial March), Empire was supposedly powerful enough to cause one of the theater's xenon projector lamps to explode mid-screening. Thankfully for Her Royal Highness and company, skilled projectionists were on hand to whip up a solution on the fly, much like R2 and the Falcon's conked-out hyperdrive. The charity premiere program extends well-deserved congratulatory sentiments from 20th Century-Fox's U.K. contingent. Sponsors and business partners associated with the production and its promotion are also given space for their well wishes. Prime real estate is granted to major tie-in advertisements. These ads for the soundtrack from R.S.O. and British toymaker Palitoy are two standouts which propagate the preeminence of the "bad guys" in Empire's marketing. A simpler two-page press folder with the celestial Vader visage on the front (akin to the U.S. credit sheet shown above in terms of its content) was printed in the U.K. and presumably handed out at prestige screenings like its American counterpart. The same Vader image can be found on the cover of this quaint German publication, a 22 page "programm" from Cinema magazine. "Filmprogramms" were issued for most popular genre films that played in West German and Austrian cinemas dating back to the mid 1960s and continue to be offered in German-speaking countries to this day, primarily for select blockbusters. 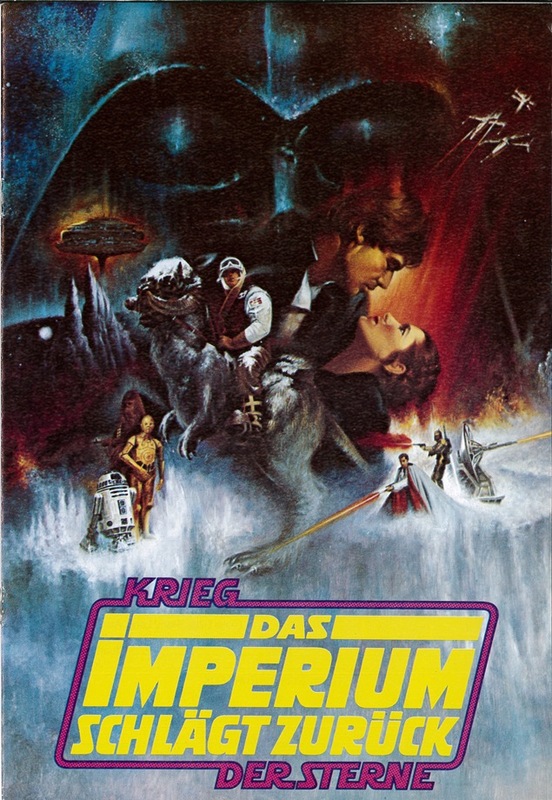 Formatted as a mini-magazine of sorts, the programm for „Krieg der Sterne“ 2 informs readers that the sequel is the second of 9 films, spotlighting Empire's new and returning characters, the plot, the special effects, and the principal creative forces. Despite his limited role as Obi-Wan Kenobi, "Weltstar" Alec Guinness is given an entire page in tribute. Meanwhile, Boba Fett ("The Brutal") is portrayed alongside 3PO ("The Educated") and R2 ("The Clever") as one of "the most famous robots in the world!" with the roughly translated description of an undercover "Robot-Man with unrivaled power." No one knows whether this cruel, versatile galaktischer Kopfjäger is a man or machine... The original mystique of the character is preserved wonderfully in this obscure profile. Callouts for the soundtrack and novelization are inserted, as well as a mention of the Empire Strikes Back Hotline in the States (which aptly utilized its domestic release date – 1-800-521-1980 – as the digits). Germans could only call the line and hear from Vader and the heroes via Switzerland. Below is a section on the film's special effects wizardry opposite one of the program's multitude of advertisements. DAS IMPERIUM SCHLÄGT ZURÜCK was the featured title in Neur Film-Kurier (or N.F.K.) Issue No. 278, disbursed in December 1980 to coincide with the film's December 11th release in Austria and West Germany. Measuring around 7 x 10", the publication consists of 12 pages of black-and-white photos and information about the cast, crew, and making of the film. The front of the issue's interior lists the cast and primary production credits opposite a publicity photo of our protagonists. Less flashy and commercial than the Cinema programm, N.F.K's issue appears to be geared toward true Sci-Fi cinephiles. The Austrians were likewise keen to disclose Hamill's love for "Wassersport" in their coverage of the actor's "galactic jump" into his career. Empire's Japanese trade paperback size program maintains the high quality of that for the original film, with legendary poster artist Noriyoshi Ohrai's artwork for the country's Style A one sheet on the cover. Once more, the program is packed with a substantial amount of color stills, this time with chronologically organized and themed spreads illustrating the film's new environments. With the franchise well-established at this point, the second film's program reflects the presence of merchandising tie-ins, as seen with the above advertisement for the soundtrack album from R.S.O. Records. The cliffhanging spread at the tail end anticipating the follow-up film utilizes a large, up-close still image of the medical frigate with great detail and the back cover appropriately shows the vessel flying off into distant space, closing on an "until next time..." note just as the movie does. Japan's oversize program for Empire steps things up a notch with the one of the most stylish offerings of any country. Measuring 13.25 x 14.25" and comprised of 12 pages, the program makes Ohrai's outstanding image even cooler. The expanding effect of the cover artwork is somewhat reminiscent of that employed in a couple of the film's trailers; for example, this teaser trailer relying heavily on Ralph McQuarrie's concept art. The back cover has its own graphically attractive design. Once more, full color photos are a plenty, with several images that are not as familiar as others seen in promotional material. One such case is the photograph of the Rebel soldiers in retreat as seen in the spread below, which manifests a less common and markedly grim angle of the scene. Return of the Jedi's release saw the return of the Official Collectors Edition format. Its cover appealingly sports Tim Reamer's Style A poster artwork, which – as mentioned in the highly recommended Star Wars Poster Book (2005) – was designed with the intention to "sum up all three films in one kind of poetic symbol," i.e. the lightsaber. Again published by Paradise Press in the U.S. and sold in both traditional print media outlets and some cinemas, it can be found with or without the UPC, and the Australian version was distributed by Horwitz, a publishing house suitably known for its publication of pulp and popular fiction. The decidedly behind the scenes emphasis in the Jedi edition speaks to the massive mythmaking emporium that Lucasfilm and ILM had become by the time of the film's development and production. A good portion of the magazine is dedicated to anecdotes from visual effects, sound design, and creature shop stalwarts such as Dennis Muren, Ben Burtt, and Phil Tippett. The latter contributes a quote that embodies it best: "After Star Wars and The Empire Strikes Back, Return of the Jedi was to be our Graduate Thesis." Its style lacks the kitschy character of the previous two Official Collectors Editions, but the content is dense with facts that fans must have found fascinating. The plot is briefly laid out at the start, with the rest (and bulk) of the publication formed around the pre-production, on location, and post-production phases of the film's creation. It's almost like the Jedi segments from From Star Wars to Jedi in print form. Just as with the first two films, the saga's third installment had its own matching fouldout pre-release and press screening credit sheet with the customary red and black Jedi logo on the cover and complete cast and production credits listed inside (including all 66 Ewoks and 9 "Mime Artists" that helped fill Jabba's Court and the Alliance ranks). R2-D2 has unceremoniously been relegated to the supporting cast while the Ewok God C-3PO remains among the leads. As a side note, for an entertaining first-hand account of life as a stunt Ewok on the set, check out this episode of the I Was There Too podcast with the above credited Kevin Thompson, who played "Chubbray" and Paploo's speederbike stunt double. 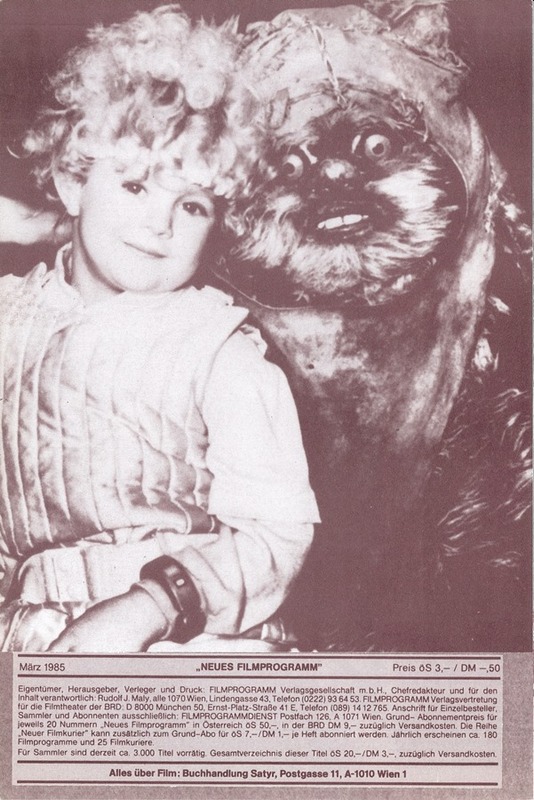 Canadian moviegoers had the opportunity to pick up the Return of the Jedi issue of Tribute magazine in the spring of 1983. Circulated solely in Odeon theaters, the entire publication is earmarked for the eagerly awaited Trilogy finale and has all the essential ingredients of the other movie programs and Official Collectors Editions mentioned – color photos, a synopsis, actor profiles, and blurbs on the making of the film – only adapted to a truly typical magazine format. Ads for other upcoming films such as Superman III, Psycho II, and Porky's II: The Next Day (1983 was quite the year for sequels) and Canadian libations like Labatt's Blue beer and Adams Private Stock rye whiskey are intermixed among all of the Star Wars substance. To learn more about Canadian cinema magazines from the Original Trilogy era, check out Star Wars at the Movies Podcast Episode 3 and this blog post for an in-depth look. DIE RÜCKKEHR DER JEDI-RITTER's filmprogramm was released as Neuer Film-Kurier Issue No. 325 in December 1983 in conjunction with the film hitting Austrian and West German screens on December 9th. Drew Struzan's stunning artwork for the teaser poster graces the cover. Er hat dir eine frage gestellt! Was ist das? The publication presented a new "WER IST? - WAS IST?" feature to orient readers with the expanding Star Wars lexicon, reminding them of returning regulars such as Darth Vader (auch der Schwarze Lord), Boba Fett, and perhaps most importantly, the droid surgeon 2-1B, in addition to introducing new entries like the A-Flügelmaschinen (hey, what about the B-Flügelmaschinen?) and Jabba's frog-dog Bubo (considered a "mascot" by the Jawas). The cover artwork of Jedi's Japanese trade paperback size program is a hybrid of the U.S. and Japanese Style A one sheets. Its silver English logo and image border is an especially nice touch. As for its content, the chronological and geographical arrangement of color photos from the Empire program is repeated, with spreads for Tatooine and Endor showcasing the new film's principal locales. Focal elements of the story such as the Rebel Alliance, the Ewoks, the Emperor, and the Jedi are administered equal treatment to complete the narrative. A "Staff Profiles" section almost has the vibe of the faculty section of a high school yearbook, with a noticeably expanded roster of crew members given their fair due. "Star Profiles" follow with the unseen faces behind some of the saga's storied non-human (or partially human) characters pictured "unmasked," including Anthony Daniels, Kenny Baker, Peter Mayhew, David Prowse, and Frank Oz. Continuing the yearbook motif, the film's horde of new creatures are celebrated with pages for Aliens (which strangely counts the Emperor's Royal Guard) and the Ewoks. Speaking of Ewoks, their live action spinoffs Caravan of Courage (otherwise known as The Ewok Adventure) and the even more grave and gruesome followup Ewoks: The Battle For Endor both saw theatrical releases overseas. With Die Ewoks: Karawane der Tapfernen being released theatrically in West Germany on April 5th, 1985, the film was featured in the Neues Filmprogramm series out of Austria. Three color variations have been found, though there could very well be others that were printed. These filmprogramms distributed in March, 1985 are simpler than those for The Empire Strikes Back and Return of the Jedi in the related Neuer Filmkurier series, folding out to reveal basic information about the franchise's newest cinematic offering. Caravan of Courage made its way to Japanese cinemas on August 17th, 1985, nearly nine months after its original airing on American television. 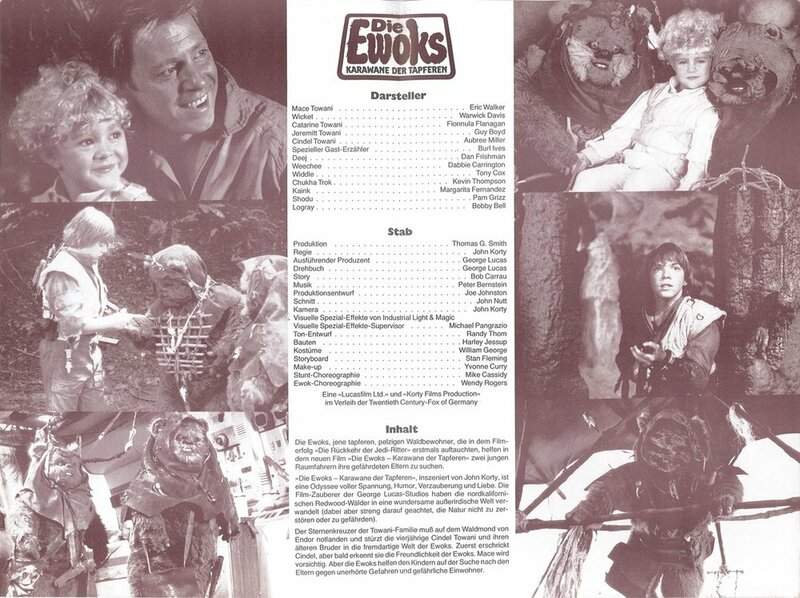 A trade paperback size program was produced which has another shot of a jovial Ewok family picnic photo on its cover, misleadingly giving no sign of the terror induced by the parent-snatching Gorax. The Battle For Endor debuted in the country on March 21st, 1987. With the franchise drifting into obscurity at this point, the film's program has far out cover artwork that, like the movie itself, goes completely off the rails. Its mythical airbrushed aura would be more suitable as the centerpiece of a tie dye t-shirt, but is still nothing short of amazing. Special thanks to Todd Chamberlain, Tim Drummond, Phil Heeks, Duncan Jenkins, Richard Temple, Pete Vilmur, and the Tantive XI Forums for their contributions to this article.